How to remove insignificant decimal point in Google Spreadsheets? 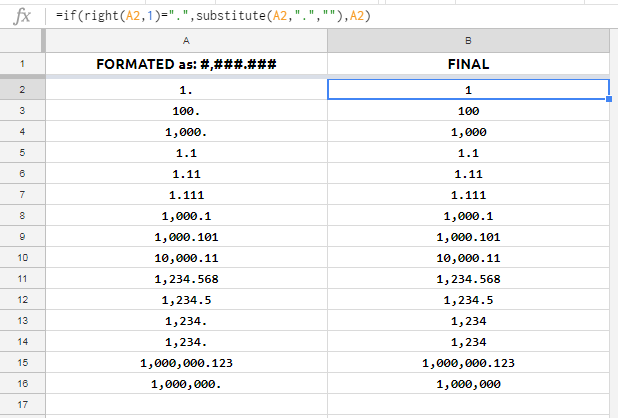 I'm trying to format a number in Google Spreadsheets. I want it to show the thousands comma, then a period ., followed by mostly 3 digits, only when necessary. I tried #,#.#, but then the period shows up always. #,#.0 doesn't omit the decimal point when its value is zero. Not the answer you're looking for? Browse other questions tagged google-sheets formatting google-sheets-cell-format or ask your own question.